It’s a common discussion among beekeepers. But what is this about? 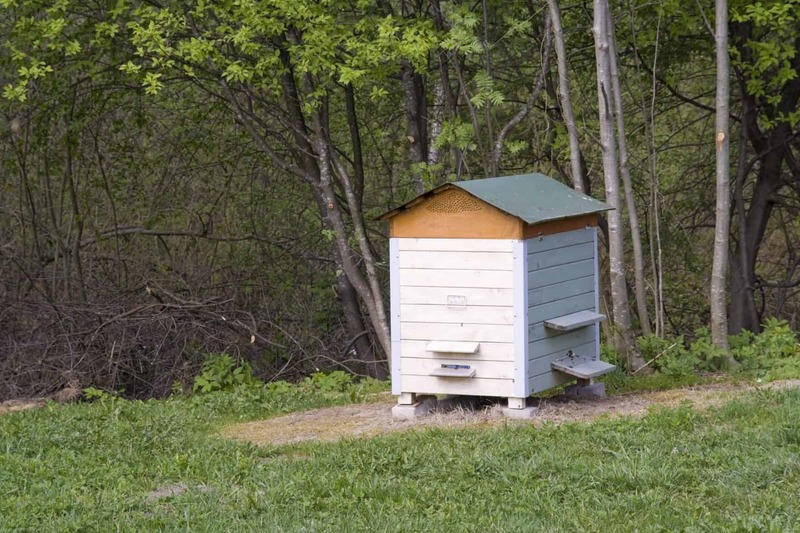 It’s about the “rules” you need to follow if you want to move a beehive. If you want to move your hive across your garden you are out of luck. When you installed your first beehive you thought long and hard about where it should be situated. You thought about the wind. You considered the availability of water. You checked the passage of shadows one sunny afternoon. The proximity of neighbors and passersby were also on your mind. It all seemed so perfect when you installed your bees. For a day or two, you were thrilled with your efforts and gave yourself a metaphorical pat on the back. Then you realized the winds were actually a little more fierce than you anticipated. That area across the other side of the garden looks perfect for your bees – perfect bees, indeed! Or maybe the sun doesn’t remain as long as you had hoped. So if you just move it 20 feet to the left, it will be beyond the shade of that huge tree. No problem, you think. You can just move the hive at the weekend. It all sounded so simple until you spoke to your mentor. That’s when he came up with “less than 3 feet or more than 3 miles” (or 2 and 2 – it depends on the beekeeper!). To the new beekeeper it does seem a little surprising, doesn’t it? What’s the big deal? After all, bees have these amazing navigational capabilities allowing them to forage up to five miles away and still come right back to the hive. So why can’t they find a hive that’s been moved from one side of the garden to the other? Bees have a GPS-like capacity to learn and use the location of their hive. They use landmarks and their speed through the air, as well as clues from magnetic variations. But once they have these “instructions” in their memory, they become somewhat reliant on things staying the same. In nature, bees don’t leave a colony in a tree, only to find it has moved to another tree when they return! They do, however, know when something is amiss. If a significant change has occurred, it is met with a response to “reorient” by the bees. When this happens the bees essentially reset what they know and begin the process of discovering their new world. The rationale behind the “3 and 3” (or is it 2 and 2?) rule is that if the hive is just edged a couple of feet away they will figure it out. And if the hive is moved 3 miles or more away that will trigger the reorientation mechanism and bees will consider themselves to be officially moved! Because of all this, when we want to move the hive a short distance, we actually want to trigger the reorientation alert. There are a few choices available to you. Here are three of them. Two effectively respect the “3 and 3” rule. The other one essentially states that the “3 and 3” rule need not be respected if we can force our bees to reorient themselves. The first of the “rule respecting” options is simply to move the hive a little each night, until you reach your final position. Just go out after dark, plug up the hive (the bees are all safely inside) and move the hive a foot or so towards the intended destination. It might take a while but it works. If you plan to move your hive 50 feet this may not be the best option! 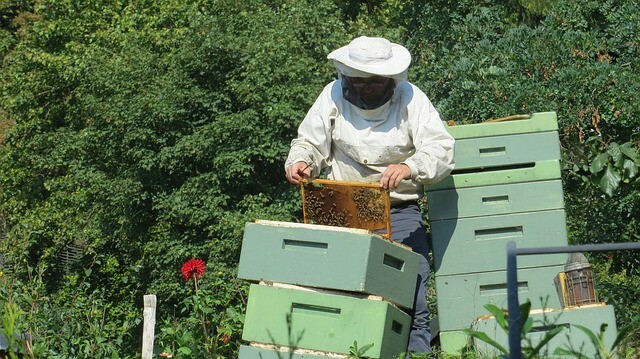 If you have neighbors who happen to wake up each morning and glance outside over your garden – but haven’t seen you moving the hive each night – well, you run the risk of making them feel they are losing it! The other end of the spectrum is to move the hive more than 3 miles away then, after a week or so, move it back to where you want it. Both moves are over 3 miles, hence triggering the reorient response. QED – but also a lot of work! Finally, there’s another option that is increasingly accepted as a way to directly move a hive any distance you want. It relies on the reorientation behavior being triggered. The key to this approach is the triggering of the reorientation response. There are two elements of this process that helps with this. Step 1 is to make sure all your bees are inside the hive. For this reason, wait till after dark when all the foraging has finished for the day and block off the entrances (both the main entrance and top entrance). At this point, your bees are captive. By the way, regardless of why you might be at a hive in the dark, don’t open a hive up at such a time. Bees are very defensive when a hive is opened up in the dark and will look to sting. Next, carefully move the hive to your new location. The logistics are obviously dependent on distance, terrain and so on. But the end result is that you have your sealed hive in its new location, which can be any distance from the original location that you like. When you move the hive, make sure there is still ventilation, perhaps by using a screen or mesh over the entrance, which still allows air to flow while still blocking the bees from coming out of the hive. The final part of the puzzle is to make sure that reorientation response kicks in. There are two things you can do to ensure this and you should do both. First, leave the bees enclosed for at least 24 hours. Being confined is outside their normal parameters and triggers reorientation. Second, place some branches or leaves at the entrance, such that when the bees leave the hive – after you have removed whatever you used to block the entrance – they have a significantly different path to take i.e. they need to crawl between the branches or leaves. This will also trigger a reorientation response. The delay before allowing the bees out may be longer than 24 hours, perhaps as much as 72 hours. The longer you leave them confined the more likelihood they will reorient, but over 24 hours will often do the trick, especially alongside the use of the branches or leaves. With this approach, your bees should catch on pretty quickly. But you may find some bees returning to the old location. For these, place an old box there. They will likely congregate there. At dark, close up the box and move it to the newly moved hive.